How dangerous are monkey bars: Risky play and the case for banning unsafe playground equipment. They broke my daughter’s arm. Why are they still around? 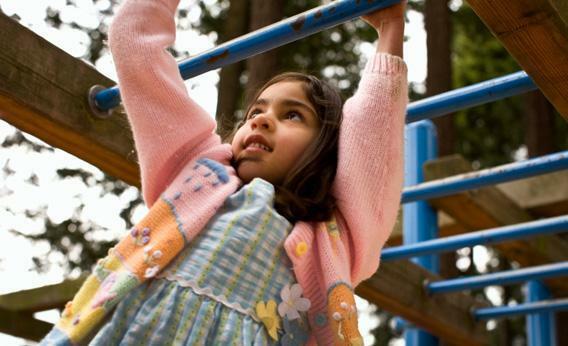 Why do we suffer the malevolent monkey bars on our playgrounds? I didn’t expect to be one of those parents who has opinions about playground equipment. Before we moved to the suburbs, I snickered at the moms who raised hell about our local park’s rubberized playground surface and its potentially dangerous heat radiation. Here at our new school, I chuckled as the PTA carefully weighed the pros and cons of installing a gagaball pit. Kids are kids, I said sagely, and they’ll play how they play, and the energy of adults is better spent elsewhere. That was before the monkey bars attacked. Getting off the bus after the second day of kindergarten, our daughter Harper excitedly told me that she was the only kid in her class who could swing all the way across the monkey bars. “Look at my hands!” she cried, showing me her developing monkey-bar calluses. “Good job!” I replied. On the fourth day of kindergarten, Harper fell off the monkey bars and broke her arm. As my wife brought our screaming child into the X-ray room, where photos would reveal a full break of the humerus just above the elbow, the hospital tech asked, “Monkey bars or trampoline?” If it were up to him, he said, he’d tear all the monkey bars down. After Harper returned to school, her new cast made her a celebrity, sitting on the playground wall during recess, receiving well-wishers and granting boons like a Mafia don. And as word of her injury spread among our friends at this school and at others, they shared with us their stories of monkey-bar trauma. One child broke her arm in kindergarten, and then again in first grade. Indeed, falling off the monkey bars seemed like a dark rite of passage in elementary school—the bars themselves a vengeful god demanding sacrifice, with one child sent tumbling down each autumn as an example to the rest of the kids. Lynn Douglas Shulta, a childhood friend who’s now an X-ray technician at Phoenix Children’s Hospital, tells me that 15 to 20 percent of the fractures she sees are monkey-bar related. A boy recently walked out of her hospital with long green casts on each arm, thanks to bilateral fractured wrists suffered, yes, due to monkey bars. The day Harper got her cast off, she was overjoyed. We had a playdate scheduled that afternoon with her best friend Caitlin. But Caitlin’s parents emailed at lunchtime to cancel: They were on their way to the hospital because Caitlin had broken a wrist. Guess what she fell off of. Why do we suffer these malevolent goons on our playgrounds? Shouldn’t we just replace monkey bars with playground equipment less likely to maim our children? It seemed crazy to me that our playground would feature a piece of equipment that everybody knows tends to cause lots of serious injuries. I headed to school to check out these silent plastic killers, ready to become That Kind of Parent. Well, the monkey bars didn’t look that dangerous; unlike old-school jungle gyms, there’s no danger of a child hitting multiple bars on the way down. And they weren’t very high—just slightly taller than me, with a layer of mulch underneath. Harper, her arm barely healed, gazed at them longingly, only moving to the slide when I reminded her that her doctor told her to take it easy until Thanksgiving. A friend watched her daughter traverse the bars backward, marveling that the child who’d once been nervous and physically tentative was now an adventuresome first-grader. Have parents advocated for the end of the monkey bars at Jamestown Elementary? Despite the helicoptering moms and dads buzzing around our suburban Virginia enclave, Kenwyn Schaffner, my daughters’ principal, says they have not. The playground meets federal safety recommendations (which give guidelines on monkey bars but do not counsel against them) and is approved quarterly by a county inspector. Schaffner points out that kids, being kids, have plentiful opportunities to injure themselves regardless of the scenario. Recently a child broke his ankle running across the soccer field: “There was no hole, no rock or anything. He just tripped over his own feet.” Short of cocooning our darlings in bubble wrap, nothing’s going to keep them completely safe. Indeed, there’s a new school of thought suggesting that contra my monkey-bar concern, more challenging—even dangerous—playgrounds might be better for children than safer, simpler ones. Two Norwegian researchers, Leif Kennair and Ellen Sandseter, recently wrote a paper advocating “risky play.” They argue that children who aren’t given the chance to negotiate difficult physical challenges might grow up more fearful than children who risk (relatively minor) injury and make it through. The occasional broken bone, twisted ankle, or knocked-out tooth may be traumatic, but those injuries are “species normal”—that is, the kinds of injuries children have suffered throughout human history without any permanent damage. So maybe I don’t want to forcibly uproot the monkey bars from my children’s playground. But if one little girl had to be sacrificed to the monkey gods this fall, did it have to be mine? It’s easy to call a broken arm “species normal” when it’s not your child who’s screaming in pain. I asked Shulta, the radiology tech, if monkey bars ought to be outlawed from playgrounds, or if I should just get a grip. “Get a grip is right!” she wrote back. “How many times when we were younger did we climb on stuff?” In her view, it’s not the monkey bars that are the problem: “It’s the padded ground below the monkey bars that needs to be improved on.” So there’s the solution! Look for me to head down to Jamestown Elementary this weekend with a couple of spare mattresses.